The Institute for Healthcare Improvement's 27th National Forum last month was a standout event for many reasons. A learning expedition at Universal Orlando to learn about safety and reliability strategies (more about that in my next post), Magic Johnson talking about his HIV/AIDS advocacy work, running into old friends, and making some new ones. 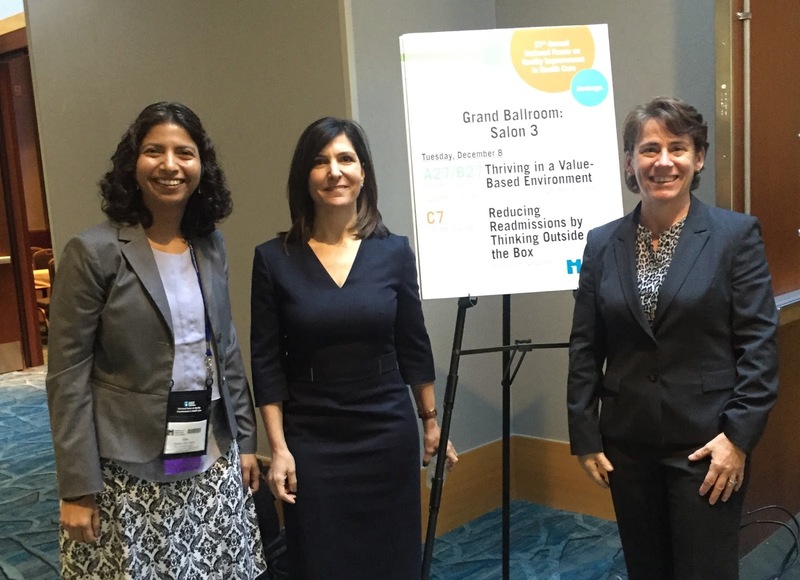 One memorable experience was facilitating a buzz session on delivering high value care along with two fellow Californians - Lisa Schilling, Kaiser Permanente’s VP for Healthcare Performance Improvement, and Anna Roth, CEO of Contra Costa Health Services. Part of IHI’s effort to increase interaction at their learning events, buzz sessions are “designed to stimulate thinking and draw on the collective experience of the audience”. We ran two buzz sessions titled, ‘Thriving in a Value-Based Environment’, and were blown away by the interest they generated. We had about 300 health system leaders, clinicians, policymakers and researchers at each of the two sessions. How do you generate a lively buzz, yet keep the conversation manageable and in a format where we could memorialize the discussion? About 10 minutes before our first session started, Lisa, who certainty cannot be accused of lacking spontaneity, suggested the idea of a facilitating a Twitter chat. Not wanting to appear uncool, I decided to play along. So Lisa came up with a hashtag on the fly (#27ForumValue) and added it to our slides, and were in business. The brave souls at UC Davis Health System’s public affairs department have been working hard to get our faculty members to use social media in our work. Thanks to their Twitter 101 workshop, which I had attended a few months prior, I was all set to go. A few months prior, the American Academy of Pediatrics had even added me to their list of “tweetiatricians” – a cute little term for pediatricians who tweet. The goal of our session was to identify approaches that health systems can take to thrive as they deliver high-value care. We began each session with an overall introduction to the topic and our plans for capturing the discussion. I led a segment on engaging front-line clinicians and staff in improvement efforts, Anna led one on ambulatory care redesign, and Lisa handled co-design / co-production with patients and families. We provided question prompts after each of these three sections, and the audience divided up onto groups of 10 to discuss each issue. Our audience then got to report out their key ideas verbally or by joining our chat. I honestly enjoyed the added connection with our audience that Twitter brought to our session, and cannot wait to host another tweet chat at our 6th Annual UC Davis Quality Forum coming up in a couple of months.